The cello part for Beethoven's Symphony No. 3 in E flat major, Op. 55 has been edited by Desmond Hoebig, Professor of Cello at the Shepherd School of Music at Rice University and former principal cellist of the Cleveland, Houston, and Cincinnati Symphony Orchestras. Hoebig's bowings, fingerings and other editorial markings have been added throughout the score. Beethoven's Eroica Symphony (Heroic Symphony) was composed shortly after the Second Symphony. He finished it in early 1804 and gave its first public performance in 1805 in Vienna. The Eroica Symphony is a structurally rigorous composition of great emotional depth, and it marked the beginning of Beethoven's creative middle-period, sometimes referred to as his "heroic" phase. Beethoven designed the piece as a memorial to Napoleon, who he hoped would inspire Europe to a humanist, libertarian, egalitarian revolution under his rule. In a sense the "heroic symphony" describes Napoleon’s "heroic struggles" with the large-scale first movement in sonata form, opening with two huge E flat major chords played by the entire orchestra and setting the tonality and tone of the movement. Beethoven then narrates Napoleon's death in the slow funeral march movement, and finally celebrates how his legacy and spirit were to have endured with the energy and imagination of the scherzo and finale. The fourth movement is a set of variations on a theme, which Beethoven had previously used in the finale of his ballet The Creatures of Prometheus. Download and print the score today to gain access to expertly edited Beethoven Eroica Symphony No. 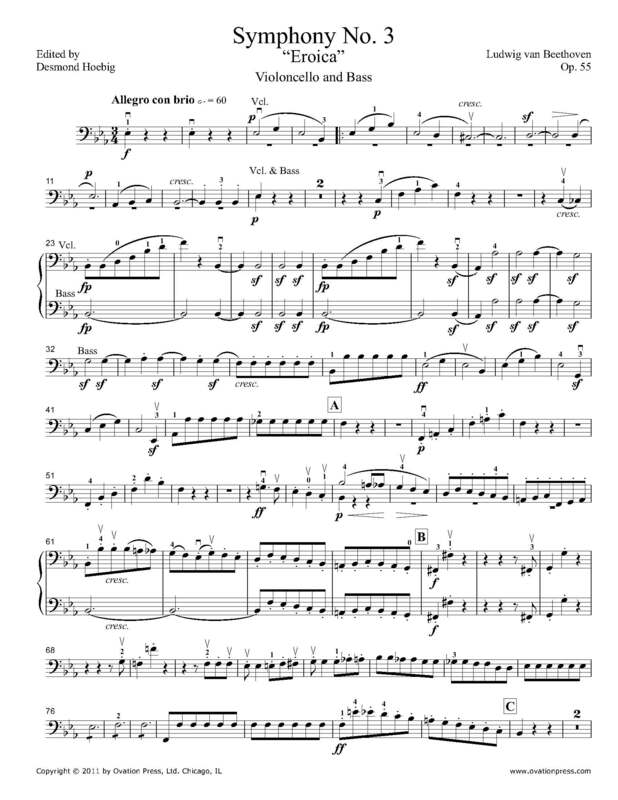 3 cello fingerings and bowings from Desmond Hoebig!